Course: 10 mile out and back format. Mostly flat with a slight uphill grade near the turn around point. 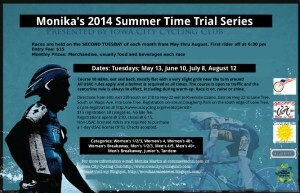 Entry fee: $15, first rider off at 6:30 pm. Rules: All USAC rules apply and a helmet is required at all times. The course is open to traffic and the centerline rule is always in effect, including during warm-ups. Race is held rain or shine.